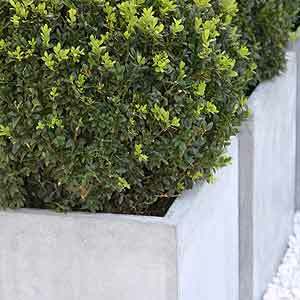 For low formal hedges, English Box in one of the most popular of all of the Buxus varieties. 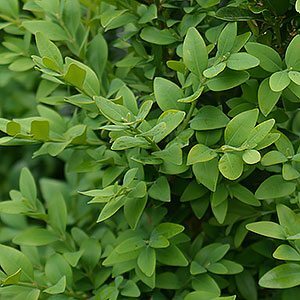 It is slow growing, making pruning less demanding, it has a naturally dense growth habit and the trademark glossy green foliage. Not only used for hedging where it is planted from 15 – 30 cm apart, it is also widely used in topiary. The slow growing nature means that English Box (Buxom sempervirens) can be kept looking neat with 2 – 3 pruning sessions a year. The planting distance depends on how tall you want the hedge to grow and how fast you want it to fill in. It also depends on the soil, English Box planted in poor soils can struggle with the competition if planted to closely. You can buy plants either bare rooted in winter or as potted plants year round. It is far cheaper to buy bare rooted plants. The amount of care will depend on the soil, and if you are growing the plants in the ground, or in containers. In the ground, and in good soil, you will need to water through the first summer. After this care, besides pruning is minimal. In containers you will need to water regularly, and also fertilise more often. The root system should never be allowed to dry out. Landscaping Uses – Used for hedging, topiary, knot gardens and as an evergreen container plant. Position – Best in full sun, some shade is acceptable, power deep shade does not suit. Soil – For best results a humus rich, fertile well drained soil is best. English Box will grow in poorer soils, however with poorer results. Soil should tend towards the alkaline side rather than acidic.